A timer interrupt is often used to launch an Interrupt Service Routine (ISR) that may toggle a port pin or some other function. Prescalers can be used to extend the time delay although the timer prescale limits may not produce a large enough delay. This is where a tick counter or a counter that increments on every timer overflow can be useful for creating longer delays. This can be included in the ISR, but within the MPLAB® Code Configurator (MCC) generated driver code for timers is a callback function that handles this tick counter automatically. By setting a callback counter value during the MCC driver setup, longer delays are easily established. 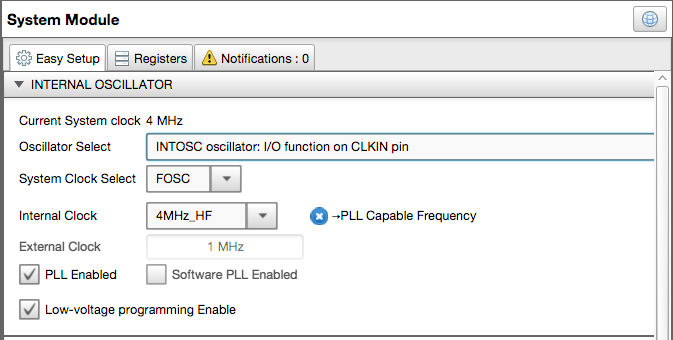 This project shows how to control the flash rate of an LED using a callback function. Create a new project and select the PIC16F1619 along with the Curiosity Board and MPLAB XC8 compiler. Add the 'TMR4' peripheral to the project from the Device Resources area of MCC. To do that scroll down to the Timer entry and expand the list by clicking on the arrow. Now double click on the TMR4 entry to add it to the Project Resources list. 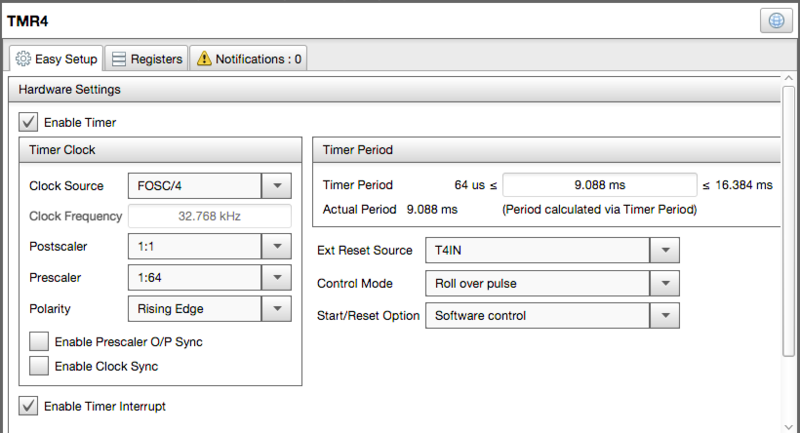 Then click on TMR4 to open the Timer 4 configuration setup screen. Set 'Start/Reset Option' to Software Contro (this will inhibit hardware reset of timer). Check the Enable Timer Interrupt box. To extend the Timer4 based delay, software overflows will use a callback function. The overflow of TMR4 will trigger an interrupt and the MCC generated TMR4 driver code will count up to the Callback Function Rate (CFR) value of events, before calling a predefined interrupt function that will then implement the Interrupt Service Routine (ISR) in the main.c file (that will be created in step 7). To configure the callback value, enter 11 in the CFR field. This will give us about a 100 ms rate (11 × 9.088 ms = 99.968 ms). Click on 'Pin Module' in the Project Resources area. This will open up the Pin Module and the Pin Management Grid. Click on the 'RC5 Output' row blue lock to turn it green. Note: The T4IN pin will automatically be selected and show a green lock from the TMR4 setup. In the Pin Module, rename the pin RC5 to IO_LED_D7. Only the Output box should be checked. Click on Generate under Project Resources to have the MCC create the drivers and a base main.c file for the project. The main.c file needs to be updated to handle the callback function using the function pointers generated by the MCC drivers. The function pointers allow main.c to handle all operations without having to modify the driver code. The first modification is to add void myTimer4ISR(void); right after the #include mcc_generated_files/mcc.h . This defines the name of the Interrupt Service Routine (ISR) that will be created to control the LED. Now the Timer4 driver default Interrupt Handler has to be connected to the ISR defined in main.c. This is handled by adding the line:TMR4_SetInterruptHandler (myTimer4ISR); right after the SYSTEM_Initialize function. Remove the double backslash comment markers from Global and Peripheral Interrupt Enable functions. This action will include a call to the predefined macros and enable interrupts. Finally, we need to define what the ISR does when the number of callbacks is complete and the interrupt is processed. For this a macro is used that was created in the MCC generated pin_manager.h file. The macro selected will toggle the LED from off to on and on to off on each ISR call. Add the myTimer4ISR interrupt service routine after the while(1) loop. This will complete the modifications to main.c required for this project. 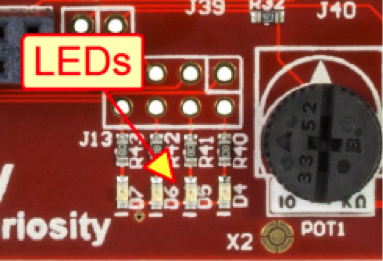 The D7 LED will begin to blink on the Curiosity Board. This shows that the callback function is working and controlling the blink rate of the LED. To prove that to yourself, go back to the TMR4 setup window in MCC and change the callback to a larger value of 55, Generate the drivers again, then Make and Program the device. This will flash the LED at the slower rate of a half second on/off. Using the callback function generated in the TMR4 driver code simplifies creating interrupt delays. It reduces the ISR in your main code to just the action you want to implement when the time delay (or the number of interrupts) has occurred. Try different callback functions and also modify the ISR to do other things such as possibly controlling more than one LED. Modifications like that will help you better understand how useful callback functions can be when using interrupts.